The flipped classroom is an educational model that ‘flips’ the traditional structure of teaching – students view lessons and demonstrations on their computers outside of class, and then use classroom time to apply their learning under the guidance of their teacher. This lets teachers individualise instruction and allows students to learn at their own pace. The term is nothing new…a quick Google search shows its use as early as 2009, but recent advances in technology, and the mass adoption of online gaming, social media and the Internet by children of all ages means the idea of the flipped classroom is gaining traction once again! Here is our 2016 view of the pros and cons of the flipped classroom. We’d love to hear your comments and ideas on the topic. In the flipped classroom model, students can learn in an environment they prefer, and at a pace that works for them. They can access the online tools and resources any time they need them, and can pause or rewind the lectures, write down questions they may have, and discuss them with their teachers and peers in class. This also allows students who need more time to understand certain concepts to take their time reviewing the material without getting left behind. This approach usually works best with science, geography and other courses that enable students to explore and research topics, such as English literature. In the flipped classroom model, valuable classroom time can then be devoted to higher cognitive, more active, project-based learning where students work together to solve problems. This helps the students to gain a deeper understanding of the subject, where they can really wrestle with the key issues. Rather than teachers using class time to dispense information, students can instead watch video lectures, listen to podcasts, read e-book content, and even collaborate with peers in online communities and discuss their learning in classroom time. In the flipped classroom model, students can benefit from a more tailored curriculum, and more 1 to 1 time with teachers. For example, with a teacher freed from dispensing information in classroom time, they can spend more time facilitating group discussions, or working 1 to 1 with children on tougher topics. Teachers using the flipped model describe how students can now move at their own pace, how they can review what they need when they need to, and how they are freed up to work one-on-one with students on the content they most need support with. In this model, teachers move into a coach or advisor role and students are encouraged to study independently or with their peers. When an educator is freed from delivering a traditional lecture at the front of the classroom, as is the case in flipped classrooms, it becomes easier to circulate and focus attention on individual student needs. An online lecture might be followed by a short quiz, also taken online, that allows the teacher to check how well each student understood the course material and which concepts need to be further addressed in class. The flipped classroom makes it easier for students who may have missed class to keep up because they can watch the videos at any time. By making video lectures available at all times online, students who are forced to miss class due to illness, sports, vacations or emergencies, can catch up quickly. This also gives teachers more flexibility when they themselves are sick and also eliminates make-up assignments. Flipped classrooms allows class time to be used to master skills through collaborative projects and discussions. This encourages students to teach and learn concepts from each other without the guidance of their teachers. By allowing students to partake in their own learning, they are also able to own the knowledge they achieve, which in turn builds confidence, and they develop important skills around taking responsibility for their learning, time planning and prioritisation: valuable skills to prepare them for further, independent education and life long learning. Of course, with the flipped classroom model, students must take responsibility for watching the lectures at home, and completing other ‘outside the classroom’ activities such as reading, online tests and assignments. Unfortunately, there is no way to guarantee students will oblige or cooperate with the flipped model and a huge focus is put on teachers to inspire and empower their students to take control of their own learning, and to follow up to ensure the students are learning what is required. One of the most prominent issues is the necessity for students to have access to a computer and Internet in order to view the lectures. This is particularly hard on students from low-income families who have limited access to resources. Schools and teachers need to ensure that all students have the opportunity to learn the online material. Proposed solutions to this problem include burning videos to DVD or increasing access to computers at school or the public library for those students who don’t have Internet access at home. Of course, the flipped classroom means additional, up front work from the teachers in recording and uploading condensed lectures, creating online tests and preparing pod casts. This content must also match the curriculum, standards and the quality or activities the students would ordinarily complete in class. This all takes time and skill, and this will require additional time and effort from teachers. However, the time and effort investment pays off in the long run, as online lessons can be easily repurposed and updated in subsequent terms. In addition to the family home requiring access to computers and the Internet, so too must the school provide the right level of technological support for teachers and students. For example, the school will need a strong WiFi connection, plenty of storage space and additional equipment such as video recorders and microphones. With the flipped classroom model, students are able to learn any time and anywhere. This will put more pressure on busy parents and carers to play a more proactive role in their child’s education – keeping up with the changes in technology, and the curriculum to ensure their children complete the work in their own time. Tools like Google Drive make it easy for students to talk to one another in shared documents when all students have their own screen, but students will be expected to manage their own workload and seek the help when needed. That said, unlike traditional classroom models, flipped classrooms give parents 24/7 access to their student’s video lectures. This allows parents to be better prepared when attempting to help their students and gives them insight into the quality of instruction their students are receiving. 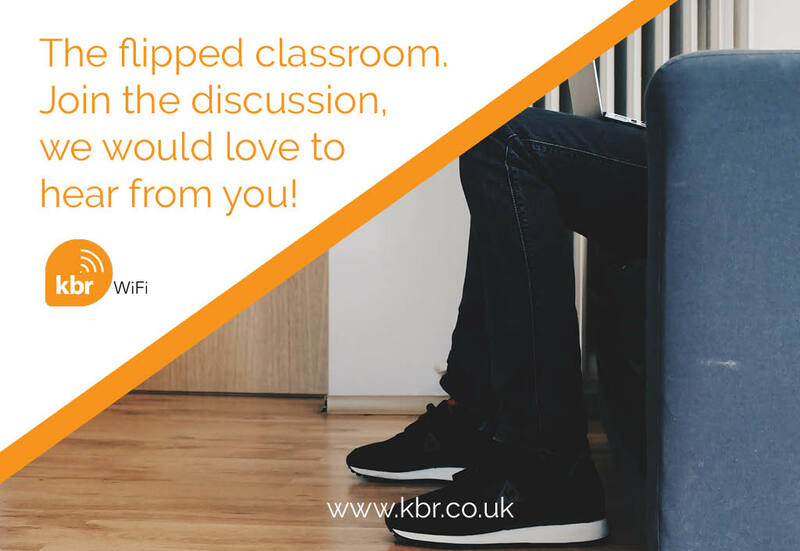 If your school is interested in moving to a ‘flipped classroom’ model, KBR can support the transition as we are one of the UK’s leading suppliers of WiFi, cabling and audio-visual software to the education market. Contact us today to discuss your requirements!